Distributor: R1 DVD from Viz Entertainment. 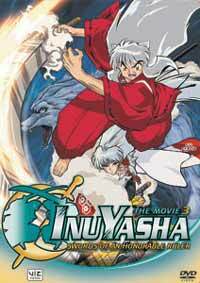 Related Series: Inuyasha TV, Inuyasha movies 1, 2 and 4. Also Recommended: Inuyasha TV, Inuyasha movie 1 and 2, Utawarerumono. Notes: Based on manga by Rumiko Takahashi, serialized in Shonen Jump/Shonen Sunday. When he lived, Inuyasha's father owned three swords. One was the Tessaiga, which was inherited by Inuyasha itself as a means to protect human life. One was the Tenseiga, which had the ability to kill the spirits of the afterlife who came for the human souls. But he also owned a third sword, the Sounga. Since the sword was evil to its core, the great dog demon chose instead to seal the sword away. Unfortunately, the seal failed just as Kagome's grandfather unveiled it in his shrine, and it eventually flew out and possessed Inuyasha, who promptly took it back to the feudal era. There, after being exorcised from Inuyasha, it eventually reawoke Setsuna, who had long coveted Inuyasha's mother, Izayoi, and didn't take too well to her loving a demon and giving birth to Inuyasha. And so, we have the plot to the third movie. As with just about any shounen shows that gets the movie treatment, the story doesn't have anything to do with the series or the manga it's based on, so it's hard to tell whether the issues taken up by the movie is ever brought up in the manga. Said manga has been completed, but it's probably still going to take some time until we get to read the whole thing in English. Either way, the third movie has chosen to delve deeper into the relationship between the two brothers; Inuyasha and Sesshoumaru. (Or at least tried to make us think it would. More on that later.) This it does by basically introducing us, face to face, to Inuyasha's father, apparently named InuTaisho (or maybe it's Inu no Taisho.) And while we don't really get to see his face completely, it's quite clear that Sesshoumaru takes after him quite some. At the same time, the movie doesn't really go into Izayoi, Inuyasha's mother, a whole lot, but enough to let us know that she's apparently a very important woman. Enough to warrant an entire squad of samurai protecting her from her loved one. And so, the movie kicks off with a fairly action-packed introduction scene that was meant to set the stage for whichever nemesis Inuyasha has to defeat to fill in this little filler before resuming the task of hunting down more Shikon shards. And no, the Shikon shard never becomes a topic of conversation at all in the duration of this movie. It's basically solely dedicated to the relationship between Inuyasha and Sesshoumaru, two brothers who apparently hate each other's guts but never really seems to find the inclination to do something about settling this problem the way they proclaim to want it the most. And so the movie thought; "Well, what if the two HAD to work together to defeat the great antagonist?" While the manga has largely avoided forcing the two together to work for a common goal, the series nevertheless introduces us to the concept by way of the demon cat tribe that appears out of nowhere in the TV series. Said story arc never really forced the issue, though, so the two brothers came, did their business mostly separately, and then left on a somewhat amicable note once everything had been settled. The thing is, when you get such a self-contained story as you do in the movies, you generally don't know where to place it. The only clues we have is that Rin is travelling with Sesshoumaru -- which happens fairly early in the manga anyway -- and that Sango has grown to show more than just a passing interest in Miroku -- which DOES happen some time later in the show. Incidentally, as a movie, it's certainly not looking very impressive. Even the TV series looked better during the first couple of episodes. The characters just look.... reduced, for the lack of a better word, and the animation isn't all that good. Again, it would have been good for a TV series, but for a theatrical movie, it's just substandard. The two first movies -- and even the fourth -- looked a good deal better than this. The first two movies even felt like movies. This one, however, doesn't. It feels more like a TV episode, albeit a bit bigger on the scales of peril. The characters are mostly acting like themselves, which is good, but the problem is that the movie itself never really delves deeper into any of them. In fact, for being mostly about Inuyasha and Sesshoumaru's relationship, the two of them don't spend a whole lot of time together. You might argue that this is just how both of them would want it, but the way I see it is that if the TV series can find some way of forcing Kikyo and Kagome together for a single episode, then the least the movie can do is to find some way to develop the two of them as siblings by forcing them to drive each other crazy for at least an hour of the 100 minutes this movie is lasting. I'm not asking for them to suddenly start getting along or anything. I just want a few more details about why they refuse to do so. The movie is just not saying anything I haven't already heard from the TV show. It's disappointing, and it's making me feel like I wasted my time watching this. The few shreds of value outside of the fights and the action comes from the beginning, which gives us some insight on his father, and a scene in the middle of the movie, where we get to see Inuyasha as a child in the company of his mother. They are, however, much too short and, again, something we've already seen in the TV show. So how do I really feel about this movie? It's alright, I guess, if you feel you really have to see everything Inuyasha has to offer. It's a fairly straightforward movie that won't leave you confused at any point in its duration. I just feel that the whole plot could have been contained within a single episode of the TV show, and none the worse for wear for it. There was absolutely no need to make a whole movie out of this, especially seeing as it neither looks nor feels like one. Oh well, at least I didn't have to see Koga in it, so I guess that's something to be happy about. Recommended Audience: While noone dies onscreen in gory glory, there is nevertheless a good deal of battle aftermaths in this movie, where blood and innards have been scattered on the ground.